Located in the southern part of the country, the Astrakhan and Volgograd region are known for agricultural products - watermelons, melons, tomatoes, aubergines, paprika, and so on. What information is available indicates that nearly 70% of the whole output is grown by immigrants from Central Asia. 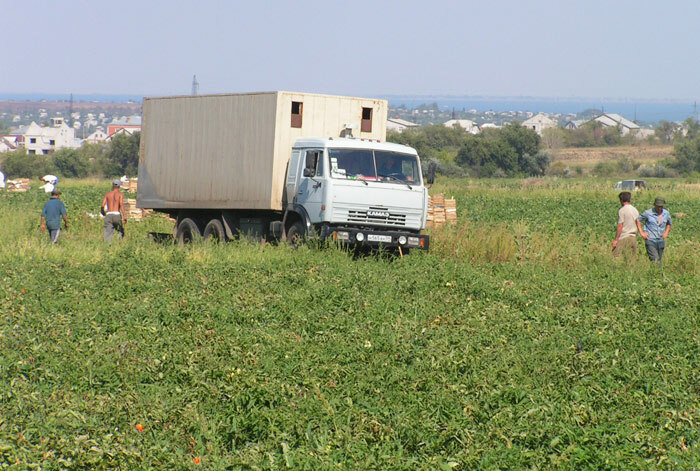 Farmers in the Astrakhan and Volgograd regions are usually Koreans, Tatars, and Russians while immigrants from Tajikistan and Uzbekistan work in the fields. 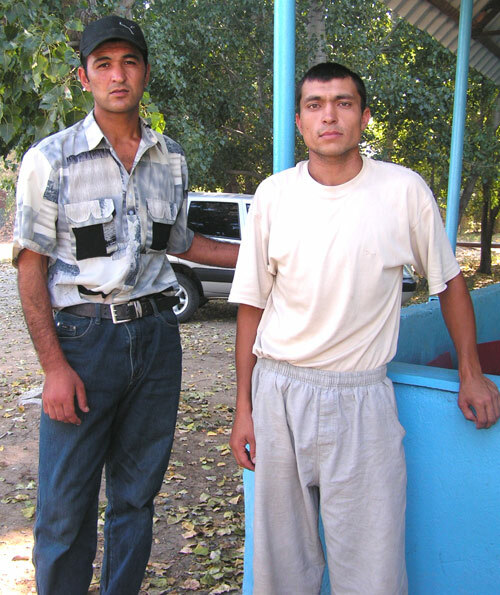 Uzbek labor immigrants outnumber the ones from Tajikistan nowadays. No longer satisfied with low wages paid them in Astrakhan and Volgograd, the Tajiks prefer Central Russia and first and foremost Moscow and Moscow region now. The Uzbeks in their turn mostly worked in Kazakhstan until recently but low wages, intolerable conditions, and attitude of the locals proved to be discouraging factors. All of that shifted the vector of Uzbek labor immigration from Kazakhstan to Russia. Here are several stories of labor immigrants also known as gastarbeiters and farms where they work. We will begin with successful ones. The government of Tajikistan recognizes existence of the problem of labor immigration. Steps are taken within the framework of international accords in this sphere. 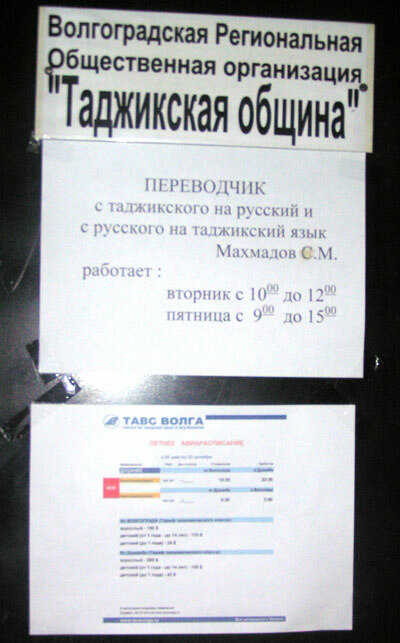 Official treaties are signed with organizations in Russia, arrangements are made for organized travel of labor immigrants to various Russian regions. This is the task of specialists of the mission of the Tajik Ministry of Labor and Social Protection in the Russian Federation. N.H. Ismatov of the mission's Volgograd division meets labor immigrants and provides transportation to designated locations. This correspondent visited one of them in Volgograd environs, a camp of labor immigrants in the Kuzmichev livestock breeding farm that belongs to the Russian Defense Ministry. 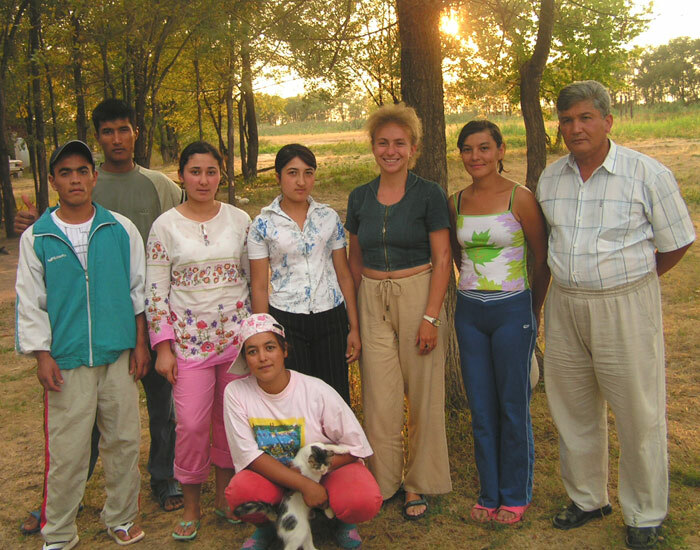 The Tajiks have been working summers in the Russian fields since the Soviet era. 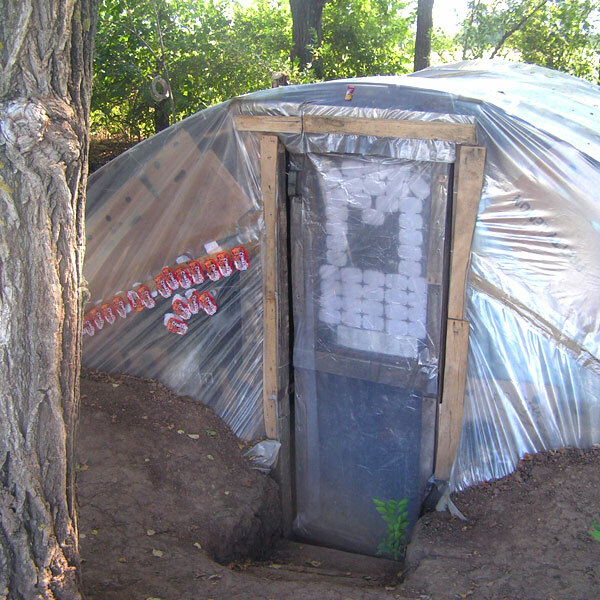 That is probably why the camp near Volgograd leaves the impression of a so called Potyomkin's Village. Conditions there are superb indeed: a diner, shower stalls, bandstand. Dancing parties are organized practically every night because most of the immigrants are young men and girls. The camp even has its own band specifically booked for the whole season. 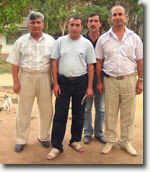 All labor immigrants here are from the northern part of Tajikistan, namely from the Sogdi (former Leninabad) region. Aged 20-25, they include a lot of young unattached men and girls, students, and families. Some labor immigrants are from more or less wealthy families, intent on earning some pocket money on their own. Hursheda from Hodjent for example is a nephew of the camp director. She is a university undergraduate. Majoring in Oriental Studies, Hursheda speaks Farsi and English. Once her thesis is written and degree earned, she says she will start seeking a job in Iran. Hursheda's family is well-educated. 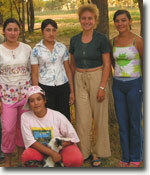 Her sisters work for missions of international organizations (they are involved in gender problems research). Labor immigrants here mostly cultivate onion. Every one of them has signed a contract (these latter are not without shortcomings, they do not specify the wages, for example). Every immigrant has official registration. The police and other representatives of the powers-that-be turn up here for surprise inspections quite frequently. That is why there is a turnpike not far from the camp. Whoever is on duty is supposed to immediately warn camp the administration of the approaching inspectors. Generally speaking, labor immigrants in the Kuzmichev livestock breeding farm are pretty well off. 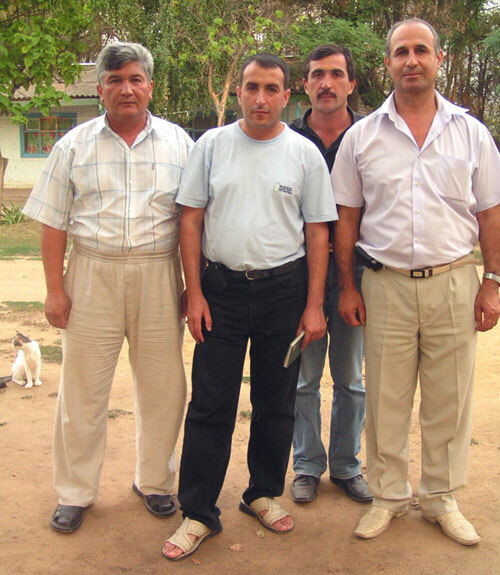 There is a Tajik community in Volgograd that is run by Saidahmad Mahmadov. Mahmadov has tomatoes, aubergines, and paprika cultivated on 72 hectares of rented land by Tajiks and Uzbeks. Mahmadov works 30 hectares himself and subleases the rest. It offers former hired hands a chance to become farmers too. Zafar from Kolhozabad is one of them. He has been coming to Volgograd for eight years now. Zafar was a hired hand the first five years and rented 5 hectares on his six trip. Leaving his family at home, he himself lives in Russia between April and October or November. Zafar has four hired hands working for him. He hires more for harvesting. Dovlat from Kurgan-Tyube is Mahmadov's foreman and manager. He has been coming to Russia for a decade. At only 40, Dovlat looks much older. "I grew old in these fields," he told Ferghana.Ru. Once a student of the Dushanbe University, Dovlat abandoned it in the 1990's when the country was in the grips of a civil war. He hired out to Mahmadov, his acquaintance of old, in 1996. Dovlat is sick of the fields. "I have to keep an eye on the guys here, make sure that they do their jobs, bring in new groups... With never a free minute." " He intends to go to Moscow next year where his brothers work at construction sites. "I'll be content to carry bricks for them," he said. Dovlat says that every labor immigrant earns in the vicinity of 7,000 rubles a month. Every gastarbeiter has official registration and a formal contract. Some labor immigrants come here year after year. There are no women here because all families are left behind. Immigrants spend so much time in Russia that many find themselves local "wives". These Tajiks return to their Russian women every year. 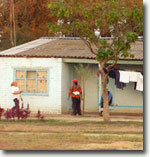 Hired hands live in shacks. Conditions are tolerable but not exactly comfortable. 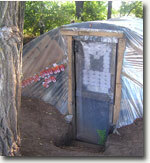 Portable ovens are used to heat the shacks when the season is growing old. This farm is more or less a success. 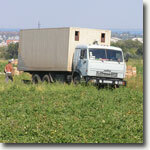 Tomato yield is 40 tons per hectare. The yield is mostly shipped to Cheboskary these days, its transportation to beyond the Urals is but a dream at this point. The stories above describe more or less successful farms, the ones labor immigrants come to in an organized and official manner. It is certainly different for "free-lancers". Some of them have all the luck - like the family from Nukus. Some of its members worked for some local Koreans last year, and so the family was not going to an absolutely strange place. Representatives of the farmer even met the family on the train in Kazakhstan. Hired hands were treated properly. The Koreans even helped them transact money home. 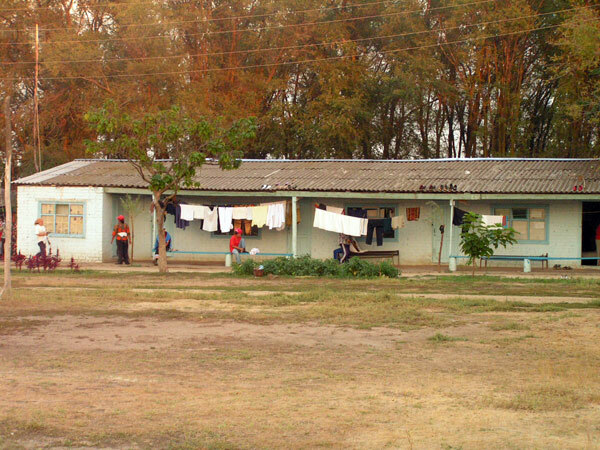 The family intends to return here in a year. Not everyone is so lucky. This correspondent heard some blood-curdling stories in Volgograd and Astrakhan. "Uzbeks here have no rights," said Bohodyr Ruzmetovich Raminov, the head of the Uzbek community in the Astrakhan region. "They may get beaten, sold, or even murdered. When they come here, they usually have problems with papers. They are without money... We suggested provisional quarters for people like that, it would have spared them life in slavery. After all, problems with papers make them easy prey. In fact, even they themselves after a while do not mind being a slave as long as they are fed and clothed." Raminov says that when the train crosses the border into Russia in Aksaraisk (about 80 kilometers from Astrakhan), border guards, customs officials, and policemen walk the carriages "milking" the passengers. In Astrakhan itself nothing prevents, say, police officers from confiscating documents from the passengers (who do not even speak Russia more often than not) and herding them all together. The rest is easy. Koreans approach the train and hear, "You need hired hands? For the fields? I've got ten heads here. 1,000 rubles per man, and they are yours." This is how labor immigrants become slaves. Even kavaran-bashis or guides themselves sell their charges every now and then. 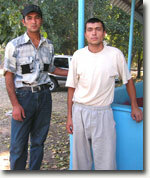 Groups of potential gastarbeiters are formed in Uzbekistan where every man is lured by promises of a fine pay. Once the group is shipped to Russia, however, it is sold to the guide's accomplices. This correspondent met a young Uzbek from the Samarkand region who had found himself in such a trouble once. It was his first trip to Russia in the capacity of a labor immigrant. The young man did not know a word in Russian but managed to persuade his parents to let him try. The karavan-bashi sold him to Koreans. Like other labor immigrants, he worked the fields all day long. "We emerged from our shacks before dawn and returned only when it was already dark," he said. "Without any days-off, naturally." The young man escaped and joined a family working fields not far away. He was treated there properly, he even earned some money, and was helped with getting on the train going back home. "Will you be coming back again?" this correspondent asked the young Uzbek. "Never," he said.